Discuss this episode on the forums here or on Comments. Carla, Kathy, and Roxanne are back from PAX and full of stories and opinions about what we learned. FACT OR FICTION: Can you pick out the confirmed fact from the tall tales? This week’s host challenge involves PvP. Shout-out to TOROcast, Ask A Jedi, TORWars, Mos Eisley Radio, and Ford for joining us at the Taphouse Grill. Read Kathy’s recap here. Jennifer Hale sighting. Autographs happen. Check out her audio interview by the New Yorker here. Ask A Jedi article on Cowan Financial Group raising investor rating for EA based on expected sales of SWTOR. Estimating that 3 million units will be sold. Forbes article. VGChartz ranks SWTOR #6, 384k boxes sold so far. PoisonTaco’s look back at the history of following SWTOR. Hard to believe some folks have been waiting for this game for so long. Would you like to write about SWTOR? We’re looking for a few more writers to keep content on our site. Contact us at corellianrun@gmail.com. 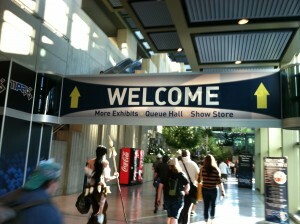 SITH OR JEDI: We find out which path we walk in real life with The Test of the Convention Line. To everyone who came to the PAX events and introduced themselves to us. To Darth Hater for making the arrangements for the Community Cantina. To TOROcast for hosting a multi-site podcast. To BioWare and especially David Bass for taking care of the fansites at PAX and for hosting the official meet and greet. To MekoRedtail, Otistoh, Deverin11 for leaving us positive reviews on iTunes. Great podcast. It’s always nice hearing all about the fun at conferences like PAX. Thanks. Gabe also talks about, in that same interview at Gamescom, crafting. He talked about crafting can re-engineer operation level loot to get a chance for a recipe for that level item to craft. Here are a few details I was able to gather from the video. Social centers like spaceports – Players will use these to group up and then go to most Flashpoints and Operations. Gabe hinted at, more to be revealed soon, about things to keep people involved in community and not just on their spaceship all the time. Heroic quests – still work in progress some solo some multiple players. Some are phased/instanced some are open world, some world arcs. The ones with multiple chains you can invite others to help even if they have not done a previous part of the chain. The style of Heroic quests will vary. Some Operations = more than one…The next Operations revealed might be harder and some might be parallel. A hard setting in one might also be equal to the easy or normal setting in another. Level of gear in loot will be determined if better with newer Operations or parallel. Crafting will scale with new content added; meaning newer loot drops equal possible new recipes of that level. Crafting vs Operation gear – Looks to be crafted items will give certain slots and Operations gear will give other slots. It is still being tested for final numbers. Gabe stated that they want to make sure crafted items and also Operation gear are both viable. Gabe teased to stay tuned about whether the new recipes from new content can be learned through Crew Skills or needing to go on Operations. 5 bosses in Eternity Vault or 5 “encounters” …the puzzle, if completed will yield boss loot. I urge you to check out this interview by The-Force.eu . they decided that was not fun at 300% because when i used my cooldowns i got like 5 shots drop aggro in some way then try not to do so much i get right back to where i was so thats why they uped it……………. Hope that helps a little with any confusion. Take care ladies.